Ben Is Back isn’t the year’s first American drama about a teenage drug addict and the parent agonizing over how to help him. Two months ago, Timothée Chalamet and Steve Carell acted out that same scenario in Beautiful Boy, a film so committed to capturing, in agonizing detail, each step (and misstep) on the road to recovery that it sometimes felt like a feature-length montage, always jerking the characters forward or backwards in time, never pausing to live in the present tense of their tumultuous lives. Written and directed by Peter Hedges, who’s cast his son, Lucas (a.k.a. Lady Bird’s other boyfriend), as the addicted teen, Ben Is Back offers an alternative approach. Unfolding over the span of about 24 hours, the film zeroes in on a single chapter that Beautiful Boy covered in just a few illustrative minutes: a prodigal son’s tense return home after a stint in rehab, all eyes on his attempt to stay clean. It’s not a terrible angle, and the setup, which finds the filmmaker returning to a one-day holiday timeframe à la his directorial debut Pieces Of April, is promising enough. 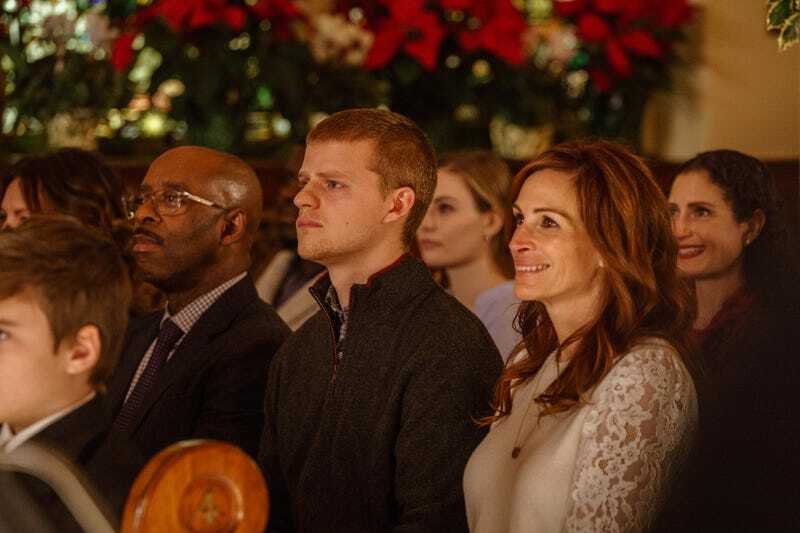 Ben Is Back begins on the morning of Christmas Eve, when Holly (Julia Roberts, first seen flashing that famous mega-watt smile in a church pew) pulls up the driveway to her suburban home to find her 19-year-old son waiting at the top. Ben (Hedges), who basically had to be chased out of the house and into rehab six months earlier, has come back for the holiday—an unannounced return that sets on edge both his younger sister, Ivy (Kathryn Newton, who also played Hedges’ sister, dead and un-avenged, in Three Billboards Outside Ebbing, Missouri), and his stepfather, Neal (Courtney B. Vance). Holly is anxious about the reunion, too, but after hiding the pills and jewelry, she works out a deal: Ben can stick around through Christmas, on the condition he take a drug test and submit to round-the-clock surveillance. These opening minutes lay the groundwork for a claustrophobic domestic drama, compounding the normal stress and hectic activity of the holiday season (including an impending church pageant featuring the family’s two youngest children) with the hanging threat of a relapse. Roberts, in her meatiest role since August: Osage County, keeps Holly’s anger and compassion in equilibrium (she seems torn, in most moments, between hugging and slapping her self-destructive offspring), while showing how this well-meaning mother can be part of the problem, too, even when she’s trying to be supportive. (We learn that Ben came home, against the advice of his sponsor, because Holly offhandedly told him that it’s what she really wanted for Christmas.) Meanwhile, the film acknowledges the obstacle course that honesty can create for a recovering addict, smothered by the very distrust he’s openly, explicitly encouraged in his family. Trust, as it turns out, is what Ben Is Back most critically lacks. It doesn’t put much into the relationships or the pressure cooker scenario it’s created for the characters, instead goosing the plot with melodrama: a Christmas Eve break-in that sends Holly and Ben fleeing into the night in search of a kidnapped dog. From there, they end up grappling with some heavy secrets from Ben’s past, along with a predatory teacher, a bereaved and enraged father, and—in the silliest twist—a whole drug-smuggling network. The charitable read on this turn toward Adventures In Babysitting territory is that it’s abstractly condensing the entire negative effect Ben’s addiction has had on his family’s life into a single dark night of the soul—a reckoning for mother and son alike. What it really feels like, though, is the filmmaker flinching from the demands of an intimate, contained character piece, manufacturing a bunch of preposterous developments to get out of actually grappling with material this serious. But then, maybe it would be silly to expect gritty realism from the writer-director of Dan In Real Life and The Odd Life Of Timothy Green. Though the elder Hedges insists the film is personal, and loosely inspired by the struggles of actual family members, little about Ben Is Back feels specific or authentic—its transformation into a quasi-thriller betrays Hollywood instincts that apparently couldn’t be suppressed. Nor does the younger Hedges make much of an impression playing a character defined almost exclusively by his vice and regret; this is the least distinctive of the troubled middle-American teenagers he’s added to his resume, including the two other ones from this season alone. Ben Is Back, which buries its promise, premise, and stray traces of insight under a heap of narrative contrivance, leaves you itching for a drama with something solid to actually say about addiction. You know, like Beautiful Boy does, even when it’s moving more like a music video than a movie.